Hendrik Andriessen's music like that of Henk Badings and Willem Pijper used to be dependent on Donemus for its recorded exposure. True, there were discs from Decca and Philips but Donemus took the strain. More recently it has been CPO that has borne the music far and wide, not that Olympia (not that recent after all) and Etcetera should pass without mention. 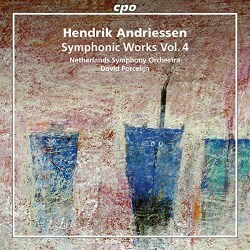 The present disc is the fourth and final Andriessen entrant from CPO after previous volumes (review ~ review) gave us the other three symphonies. The present disc, like its predecessors, has also wended its way by reviving previously unrecorded works. Andriessen's Fourth Symphony is a fully mature article in three economically scored movements. There's never any suggestion of stodge or textural congestion. The first movement is a storming and ceaselessly forward-surging release of self-sustaining energy. The central movement is cooler yet somewhat romantic, most delicately orchestrated and almost impressionistic. The finale shares the rhythmic energy of the opening movement but paints over it a victorious, brass-dominated exultation. While never as romantic as Alwyn this symphony shares parallels with the British composer's pounding Fourth Symphony. The last few bars make for what comes across as a masterly symphonic conclusion - observing the conventions but adding a fresh twist. The Rhapsodie - Libertas Venit comes from the same year as the Symphony. It starts out grim and trudging, at first shot through with concentrated tragedy and with hints and wisps of the Die Irae which is stated in full at 4:40. At about 5:00 the mood and temperature changes with an optimistic Egmont-like swing and the letting in of light. It marks the tenth anniversary of the province of Brabant's liberation from the Nazis. Given its date it might seem strange that the Capriccio is so sweet, gentle and carefree. The shortest work here is the Canzone written when Andriessen was 79. It is another light-suffused piece which combines serenity with the same Beethovenian tint - rapture and conflict - that can be heard in the Rhapsodie. David Porcelijn has presided over the Netherlands Symphony Orchestra for the other three Andriessen volumes and continues in that capacity here. The orchestra are on stunning form and their excellence - and that of the music - is well voiced by the recording choices made by both engineer and producer. The fairly fluent note is in German and English. It's is very much to the point and avoids the literary circumambulation which has afflicted some of the CPO issues. All credit to the writer Leo Samama.